The Toronto Maple Leafs have made one more change to their shuffled lineup ahead of tonight’s game against the St. Louis Blues, sending centre Frederik Gauthier to the Toronto Marlies, according to the AHL’s transaction sheet. In his place, Ben Smith is expected to return to the lineup. Gauthier heads down to the Marlies after playing eighteen games with the Maple Leafs. In that stretch, which began in mid-December, the 21-year-old picked up two goals, an assist, twelve shots on goal, thirteen hits, fourteen blocked shots, and 21 penalty minutes. Gauthier played an average of 9:39 a game of ice time over his month and a half, with usage on the penalty kill as part of the equation. He was also a little over 51% on the faceoff dot, a trait that Mike Babcock values deeply in his fourth centres. On the fancier side of the game, Gauthier averaged 1.2 points in every 60 minutes played at even strength, 9th among 13 regular Leafs forwards this year. His relative Corsi-For percentage sits at -4.6%, 12 in that group 13, though it had started to climb over the past couple of weeks. Ben Smith will fall back into his regular position as a result of this move. The 28-year-old was sidelined by an upper-body injury that, combined with a brief disappearance of Tyler Bozak, led to a temporary call up of Byron Froese and the aforementioned Gauthier. Smith’s production is identical to Gauthier’s in goals and assists (2+1), but he’s required two extra minutes a night and six extra games to reach that mark. Smith is Toronto’s worst regular forward at rate production (0.70 points/60) and relative possession (-5.9%), but has won 53.2% of his faceoffs and, thanks to 0.943 goaltending while he’s on the ice, is the Leafs centre least likely to give up a goal on a given shift. He’s also the least likely to be on for a goal for by a significant margin, making him a net negative in that regard overall. The quick look at this move is tricky. I firmly believe that Smith is the weaker link and a detriment to the Leafs’ chances at success, but I also feel like more time with the Marlies is more beneficial to Gauthier. Ideally, the team will move towards having neither in the lineup, but in the meantime, the vet gets the edge. Smith will likely draw in tonight against the Blues, while Gauthier’s next game will probably come with the Marlies on Saturday. My thinking is that while Babcock has no problems with playing the youth, he likes having more experience on the 4th line. While Gauthier has been pretty good on the draw, Smith has been better, plus, as you stated, when he is on the ice the Leafs are least likely to give up a goal. Interesting thing is that Gauthier is not far behind. 5 on 5 Smith has been on for 1.89 goals per 60, while Gauthier has been on for 1.99. Gauthier is basically giving up the position temporarily, that will eventually be his. I suspect that part of the reasoning here is to ensure that Smith plays enough games this season that he can be exposed in the expansion draft as one of the forwards with 40 games under his belt. Smith needs to play 12 more games to meet the expansion draft exposure rules. 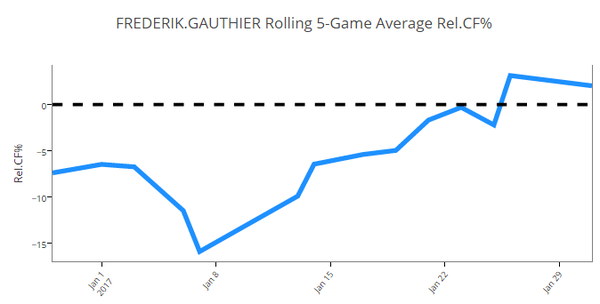 I for one, am sorry to see Gauthier head back to the Marlies. I felt the fourth line was really coming along nicely. They were starting to put some offensive pressure on opposing teams, as well a playing good defence. Ben is far, far superior to the goat as illustrated by his 2% higher rating in face offs and and and he has experience. He will of course go up against the opposition 4th line which should have a couple of thugs here and there and well the goat only proceeded to pound a Hab goon into the ice to the point they had to bring out the ice scrapers. So yeah let the goat play an extra 4 minutes a night with the Marlies and gain that valuable experience. Besides the guy was huge 6 foot 5 and 225 lbs. getting in the way of people. Ben is indeed the man. But most importantly Mr. Smith is better in the all important Corsi which decides if you win or lose a game. So there.